I am a middle-school student from Shanghai. I came to Germany for studying with the help of GEP. Before my arrival in Germany, I had learned German language for ten months and laid a foundation. After I came to Germany, I took a three-months language course. Afterwards I entered the tenth grade class in Gymnasium Lindenberg. I have already been in Germany for one year. During this year what I have acquired is not only the improvement of my German language, but also the independence of my life. In addition I have visited many different cities during the sightseeing tours organized by Humboldt, which enriched my experience. 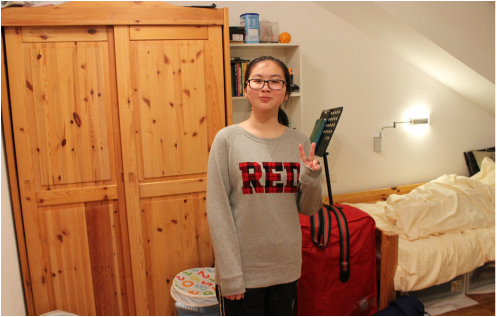 When I first came to Germany, the first thing I realized is the cultural difference between China and Germany. In public area nobody speaks loud, except for the special times such as festivals and the days of soccer matches. In that case people would celebrate on the streets and in the pubs. Pets are allowed to enter the marts and parks. Public transportation such as trains strictly follow the timetable. Even the pedestrians on the street are warm-heart. Although my habits are a little different from German people, I can adapt after a period of time. From the aspect of study, there are also huge differences between the educations of two countries. In China, students usually finish their homework at 10 or even 11. At the weekend they attend all kinds of cram classes. Some children have the class for instruments and other skills. In Germany, however, private classes only require the students who are difficult to understand the course to attend. Plus, students can take the classes as many as they want. The designation is very flexible. Certain German students have plentiful extra-curricular activities. There are various clubs in German school. Students can join these clubs as they like. Some schools would organize senior students to help younger students with the difficulties they might encounter. Of all these activities, the most meaningful one is the internship in the ninth grade. German schools require every ninth-grade students to find an internship job for one to two weeks. The units will issue certificates for the internship. Students are freely to choose the internship unit, which means students can experience the process of their interested jobs. They can not only accumulate the social experience, but also know deeper about their interests. Almost none of Chinese school is doing this, but the internship has many benefits as an education method. In my opinion, going abroad in different phases of life to live and study in another country is not only the improvement of self-abilities, but also the accumulation of the life experience. In the meantime I understand the differences between different cultures more profoundly. To see is to believe! I hope in the near future, more and more excellent people will come here to broaden the vision and learn the knowledge!